Grand Marnier French Toast is a twist on an American Favorite Breakfast treat. Many ingredients in the batter are what you would expect however the surprise of the Grand Marnier liqueur is what takes this breakfast to a new level. Another twist is that we offer our guests the option to have this breakfast made with three different types of bread. 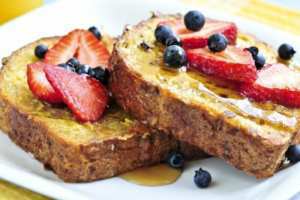 There is the French Toast bread which is made with maple syrup and brown sugar baked in or the Apple Fritter which has small slice or apple baked in or the Blueberry Struedel with blueberries baked in. Some guests are daring and try one slice of one bread and another slice of a different bread. We hope you enjoy this recipe. 2. Crack your eggs into a bowl and mix with Half and Half Cream. 3. Stir in your Sugar, Vanilla, Cinnamon and Grand Marnier liquer. 4. Pour your mixture into a rectangular baking dish so it is easier to place your bread in for coating. 5. Place your bread slices in the mixture and soak for about 1 minute then flip the slices over and soak for another minute. 6. Coat your griddle with a light spray of canola oil and a little butter. 7. Grill your French toast slices for approximately 4 minutes per side. 8. Plate your French toast and sprinkle with a little confectionary sugar and some fresh berries. 9. Serve the French toast with warm maple syrup.